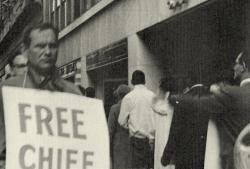 Bob Gilmore of the American Friends Service Committee (AFSC) at a demonstration outside the South African Mission to the United Nations on Madison Avenue. Gilmore is holding a sign that appears to say "Free Chief Luthuli." At the time, Chief Albert Luthuli, then President of the African National Congress (ANC), was serving a five-year banning order that prohibited him from attending any meeting anywhere in South Africa and from leaving his home district. It was Luthuli's third banning order. At the time, the ANC was also banned. Used by permission of Collin Gonze.